As part of the 2006 Angkor Photography Festival we are holding a Flickr contest. Winners’ work will be shown alongside the work of professionals during one of the evening projections in the Cambodian town of Siem Reap, near the famed Angkor Temples, and prizes will be awarded by a panel of judges. The title for this year’s Flickr contest is “Asia in the World”. The Angkor Photography Festival is a center for Asian photographers as well as photographers with an interest in Asia, so for this year’s contest we want you to submit photographs that are about Asia—the people, culture, arts, politics etc. The photographs do not have to be taken in Asia but must be connected in some way with the region. 1). Work can be submitted in one of two categories: ‘singles’ or ‘sets’. A set of images (or photo essay) can contain up to 20 images and should be organized into a single Flickr set. Images entered into the singles category must be tagged ‘angkorsingle’ and images in a set should be tagged ‘angkorset’. 2). There is a limit of 10 images per poster total (if your images are part of a photo essay be sure to put them together in a set and we will review all the images). We suggest you edit tightly and post only your very best images. 3) All images must be available on your Flickr page at a minimum 1024 x 768 points (horizontal or vertical) at 72 dpi, suitable for projection. Any images that are too small will be rejected. 4). If possible, please be sure photographs have caption information: who, what, where, when & why. There are no restrictions on when the photographs were taken. 5). Photographs will be judged by a panel of judges including professional photographers, editors and journalists. Contestants will be notified before the festival if their work has been accepted. Prize winners will be announced the night of the projection in Siem Reap and the winners from both the singles and sets categories will receive copies of signed photography books by well known photographers (to be announced). 6). All photographs will remain the copyright of the photographer. However, if your work is selected for projection, you give permission to the Angkor Photography Festival to use your images for non-commercial promotional use, including both print media and internet/digital use by the Angkor Photography Festival. This year’s festival will be held in Siem Reap, from November 25th to December 1st, 2006. If you are interested in joining the festival this year please email us at angk...@yahoo.com. 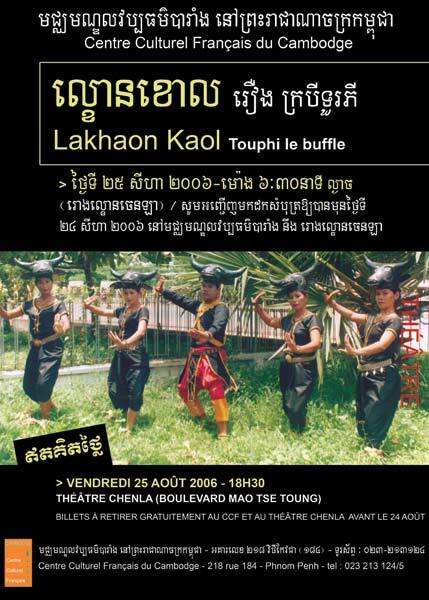 Suite au succès de la conférence du vendredi 7 juillet, et compte tenu du grand nombre de demandes, S.E Vann Molyvann présentera à nouveau son œuvre et l’esquisse du Grand Phnom Penh à l’horizon 2010 lors d’une nouvelle conférence, en Khmer, cette fois-ci. S.E Vann Molyvann répondra aux questions sur ses réalisations mais aussi sur l’évolution de Phnom Penh ces dernières années. Le Centre Culturel Français s’attache à promouvoir la jeune création Cambodgienne dans de nombreux domaines. Après les sculptures en rotin de Sopheap Pich, le design avec Em Riem, les photographies de Kosal Pisey, les peintures de Srey Bandaul, et bien d’autres encore, le CCF accueille deux jeunes artistes issus de l’Université Royale des Beaux-Arts de Phnom Penh, Chin Vanchear, Say Vesna, et deux autres de l’école de Phare Ponleu Selpak de Battambang, Mao Sovit et Lem Lorn. • Doctor’s House: A remarkable villa of the same period which has an exuberant, three-storey high entrance hall which dominates the design; now a Health Centre. • Split House: This family villa – a rich blend of materials, form, light and air which creates a delightful residence – seems to have been built to divide into two, for reasons we have not yet determined. Cost: Cambodians: $1, Others: $8, including transport by coach. Please contact us by replying to this email (contact@ka-tours.org) with your request for places; please don’t forget to include names and mobile telephone numbers and which tour you would like, otherwise sorry but we can’t accept the booking. We will email you back with joining details and contact numbers. what is hopefully already an informative and easy to use site. about the education & social cultural programs of the foundation. You are currently browsing the Sang Salapak Building Arts blog archives for August, 2006.